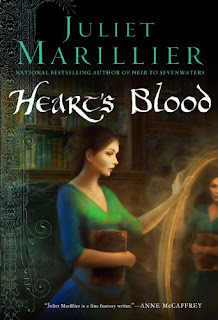 I'm ridiculously late on this one, but here on the left is the U.S. cover for Juliet Marillier's upcoming Heart's Blood (due out November 3rd). Gorgeous is what it is. I'm putting the UK and Australian covers next to it for comparison. Amazing the range you can get for a single book, isn't it? Which is your favorite? A haunted forest. A cursed castle. A girl running from her past and a man who's more than he seems to be. I think I like the first one best. Is this a stand-alone? It sounds great!! I think I like the first one best!! Juju, it does doesn't it? The middle one would be my favorite if not for the girl in the front, so I'll have to say ditto. 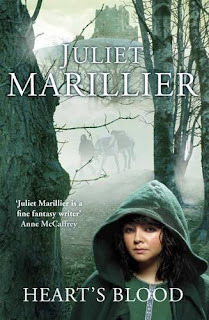 :) Btw this is sort of off topic, but how is Marillier pronounced? I assumed since it looks French (and it sounds so pretty) the 'r' would be silent, but maybe it's been Englishcized? Holly, yeah the girl in the front of the UK one is a bit...sinister looking for me. And I believe you're right--Marillier is pronounced the French way. It is a lovely last name. Obviously the publishers know their markets well. It's pretty amazing how different the covers are. I prefer the right cover, it's a Waterhouse painting called (if I remember right) the crystal ball. I have to admit that the first thing that got my atention, when I was reading a blog about the book, was this cover, I love Waterhouse work. And I can't wait to read this book! Li, that's a really good point. They're quite different, aren't they? Though each beautiful in their own way. It will be interesting to look back at them after reading it and see which one fits our individual impressions of the characters and tone. Clara, I was guessing it might be a Waterhouse. 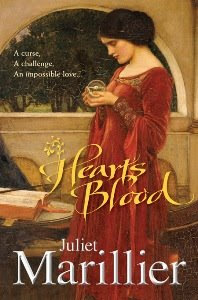 I love it when a cover catches my eye and the story turns out to be just as beautiful. Marillier always comes through and so, like you, I can't wait to read this one. Particularly interested to see how she does a standalone as she generally writes series. I do like the first one on the left. I hope she recovers okay from her chemo!!! I like the UK one (which would be why I pre-ordered it. Okay, that, and it coming out a month earlier there. :) ) The other two are also nice, though, and I found it so interesting how different they are. I like the US cover best but the Australian cover is very nice too. OMG Def the Waterhouse one. I have that painting framed in my old bedroom at home. I love it. totally o/t, but there is an exhibition of his work going on right now at the Royal Academy and I am going to see in August. Sharry, I know! I was so worried when I first read about it on her site. It sounds like she's working through it and my thoughts are with her. Chelle, you lucky dog! I love how different they are. If I were independently wealthy I would have all my favorite editions of all my favorite books. Because I am that nerdy. Ana, do you really? Awesome! I'm so jealous you get to go to the exhibition! Have you seen the new Moira J Moore cover? It's up at Amazon. What do you think? Samantha, LOL. Now Darlene is all I see. hehehe. I'm going to be in the minority, I'm sure, but I like the UK cover best. Azteclady, I originally thought that was the sole cover. The other two look more like her usual fare and I liked the doom and gloom sort of superreal look of the background on the UK one. I like the first one best, but it's a close race between that and the last one, the one with the girl in the red dress. Very pretty!